Salemane Ngakana is from the Free State. 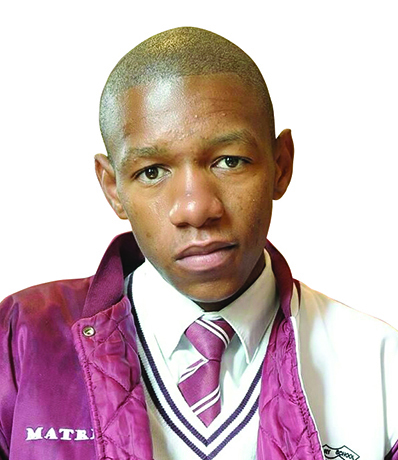 He is studying Electromechanical Engineering at the University of Cape Town. With maths and science, you can’t simply go through the textbooks or someone else’s explanations. You need to make the effort and take time to fully comprehend the principles and concepts. If you have an imaginative and logical mind, you can grasp mathematical and scientific content quite easily. I think people have misconceptions thinking they cannot do maths and science. First, they need to study the textbook. Second, they need to put effort into understanding the content. Then they need to practise. Doing exercises helps to expand on the application of a principle/concept. Finally, they need patience to study and to stick to the content until they understand it. Constantly read, watch or listen to motivational academic stories of past matriculants who did very well. You can find these in newspapers. This will help you focus especially if you are tempted to slack on your studies (which happens to everyone). It’s crucial to keep yourself motivated throughout the year. Le-Reng Secondary School is a public school in a small township called Manyatseng. The principal and the staff work hard to create an ideal environment that promotes excellence – not only in academic performance but also in other departments like sport. It is well respected in the area as it has been producing exceptional learners. I had a great time. There was incredible support from the school’s management, learners, and teachers, not forgetting the support from my family and friends. I started getting excellent maths and science grades from Grade 10 but I couldn’t bring balance to my academic performance because I struggled with my linguistic subjects. Because I would spend most of my off-school time doing maths and physical sciences, I designed a home study timetable carefully constructed according to each subject’s performance. This helped to bring balance to my academics. In Grade 11, I realised I wasn’t doing as well as I wanted to even though I was putting all the effort and hours in studying at home. To address the situation, I started a study group with other learners. Sharing and teaching others really helped and I started getting better grades. In Grade 4, I was introduced to planets in our solar system. I was really curious about the black suspension medium that the planets floated in. I did some research and discovered Einstein that afternoon after school. My curiosity has been running ever since then. Also in Grade 4, my maths teacher would offer money to whoever got full marks for tests. I guess it drove me to practice maths more and I enjoyed it more. My curiosity for science increased my interest in maths. My teachers sparked my curiosity and I’ll always remain thankful and appreciative to them. It’s important to notice how teachers have such huge roles in society but they don’t get enough credit. Deciding which career to study towards is one of the difficult and nerve-wrecking decisions, especially for those who find many careers appealing to them. I believe job shadowing is the most helpful in a situation like this, as well as researching further. I decided to study electromechanical engineering because South Africa is short of electrical and mechanical engineers. I believe the most effective solution is having generalists in the industry rather than specialists. Another reason is that I have always dreamt of building an electromechanical contraption to put in my backyard. An achiever comprises of a goal-setting habit, laser focus and tunnel vision for the goals set. Most importantly, an achiever does not compare his or her level of success with others. To achieve a goal, one needs to consider both the mental and physical aspects of the goal. A detailed goal plan will make executing the action plan easier and give you a sense of direction. You also need to be a hard worker which includes qualities such as perseverance, determination and initiative. I see myself working as an engineer physicist at iThemba. I will be working with sophisticated lab machines in research projects probing the atomic nuclei. I’ve always been amazed by Albert Einstein’s work. He and Richard Feyman are my role models. My aspiration is that my work is as influential as theirs.